In Bathing Beauty, Swim instructor Caroline Brooks (Esther Williams) angrily returns to her teaching job at a New Jersey girls school when her brand new marriage to songwriter Steve Elliott (Red Skelton) is disrupted by scheming show producer George Adams (Basil Rathbone). In order to speak with his estranged bride, Steve forces admission to the college, which has never been legally declared all female.  To rid the campus of him, Dean Clinton places Steve on two weeks  probation, during which time she plans to hit him with 100 demerits and mandatory expulsion. Steve also encounters heavy resistance from faculty, students and a distant Caroline, who wants their marriage annulled. Red Skelton playing music on glasses, only to have a drunk help  him get the glasses in tune. A well-known routine where Madame Zarka  is teaching Red Skelton how to dance … in a tutu. The sticky paper  routine, part of the ballet dancing, where Red has to lose a sticky piece of paper before the dance ends … or be expelled. It s a very funny bit, as the various students pass the paper round-robin. I truly enjoyed Bathing Beauty it did have too many extraneous musical numbers, but they re short (typically less than 2 minutes) and not distracting from the movie as a whole. The college is loaded with pretty MGM starlets. Cugie shakes up more hot South American rhythms. A fine cast, including Basil Rathbone, Donald Meek, Janis Paige, and Groucho Marx‘s favorite foil, Margaret Dumont, gives expert support. The finale is a wowser of a water ballet featuring the movies  favoring bathing beauty swimming gracefully along alternating jets of water and flame. But Esther isn t the only artistic lovely. Red dons a pink tutu for a college ballet class and reduces Tchaikovsky to chopped liver. Dive in! Be sure to read funny movie quotes from Bathing Beauty as well. In one sequence Red Skelton s character appears in a tutu. In a later interview, Red said it was uncomfortable because he had to have his chest, back and underarms shaved for this costume. At the time of its release, this was MGM s third-highest grossing film, after Ben-Hur: A Tale of the Christ (1925) and Gone with the Wind (1939). 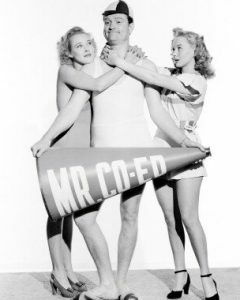 The movie was initially to be titled The Co-Ed  with Red Skelton having top billing. However, once MGM execs watched the first cut of the film, they realized that Esther Williams  role should be showcased more, and so changed the title to Bathing Beauty , giving her top billing and featuring her bathing-suit clad figure on the posters. In one sequence Red Skelton s character is trapped inside a house by a large dog. He escapes by removing the hinge pins from the door, picking up the door and, as the dog comes inside he holds the door between them and goes out. Red said that they had written themselves into a corner and could not come up with a way for him to get out. They were going to scrap the scene when the comedian Buster Keaton visited the set, took one look and told them how to do it.